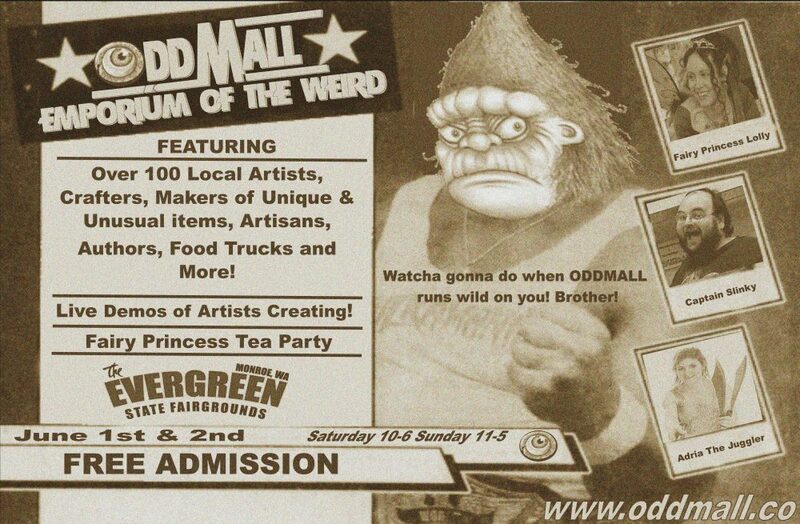 Oddmall: Emporium of the Weird returns to the Evergreen State Fairgrounds in Monroe! 2 Buildings full of vendors! Creepy doll creations -Here is an article about me and my art that just came out this month. We specialize in leather armor, steampunk hats, costume pieces, and depending on the season, men’s clothing including standard vests and corset vests. Our Facebook page has lots of photos. Hand made steampunk jewelry and art. The items I sell are mainly video games and toys but I branch out into comics/manga/board games. If I have enough available then we sell home made dice bags too. Chalk couture decor items. Clothing and household decor. Items to make your own home decor. Boutique kids clothing and accessories. Unque Jam, Jelly, Syrup and Sauces. Flavors like Dark Kiss which is Blackberries and Dark Red Wine. Uncle Dan’s, Garlic Ginger Sauce and over 30 more fun flavors.